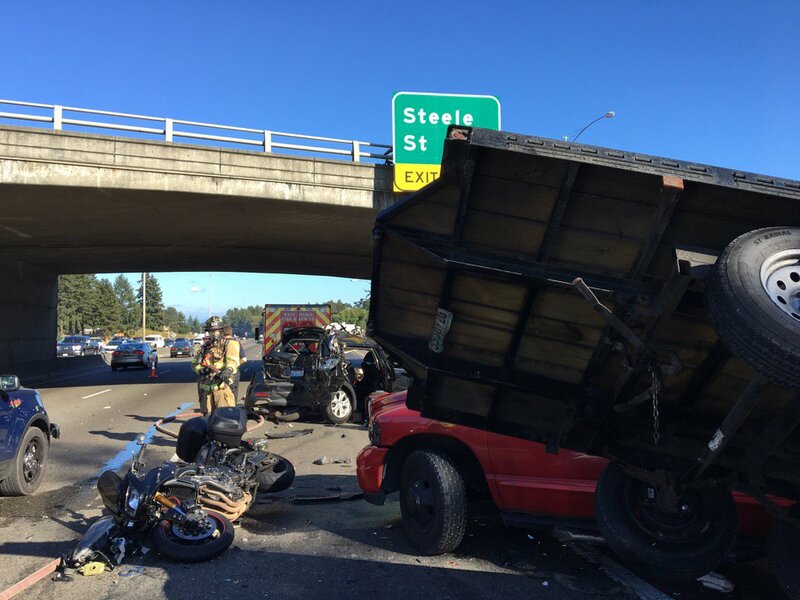 A motorcyclist is dead as the result of a multi-car collision in Pierce County on Thursday, a crash which involved a semi-truck, according to the Washington State Patrol. State Patrol said the collision involved five vehicles and a motorcycle. The motorcyclist died at the scene. According to reports, the crash was caused by a semi-truck going eastbound on state Route 512. The semi-truck attempted to switch lanes when it hit a pickup truck. The semi then hit another pickup truck. The second pickup truck then hit another car, State Patrol said. The motorcyclist, who was also heading eastbound, was either involved in the collision or was attempting to avoid the chaos, police said. The driver of the car hit by the semi and the driver’s two children were taken to Mary Bridge Hospital in Tacoma. One of the children has a broken leg, according to reports. State Patrol said a drug recognition expert (DRE) was brought to the scene of the incident to examine the semi-truck driver. The investigation is ongoing. Long hours behind the wheel can drive truckers to use drugs and alcohol while on the job. The National Transportation Safety Board has said that drug usage, including alcohol, is the second largest contributing factor for truck accidents, trailing only fatigue. Pre-employment testing: The Federal Motor Carrier Safety Administration, an agency within the United States Department of Transportation that regulates the trucking industry, requires a negative drug test to operate a commercial motor vehicle (CMV). Testing after an accident: The FMCSA requires a drug and alcohol test for all truckers after a fatal accident, or if the they are issued a ticket following an accident that results in an injury. Random testing: All commercial truck drivers must undergo random drug and alcohol testing. Reasonable suspicion testing: If a supervisor observes suspicious behavior, they can make a trucker take a drug and/or alcohol test. Return-to-duty testing: If a trucker fails a drug or alcohol test, one of the final steps to returning to work is another drug/alcohol test. Follow-up testing: Truckers that return to work after a previous failed test must submit to a minimum of six unannounced tests within the first 12 months back to work. 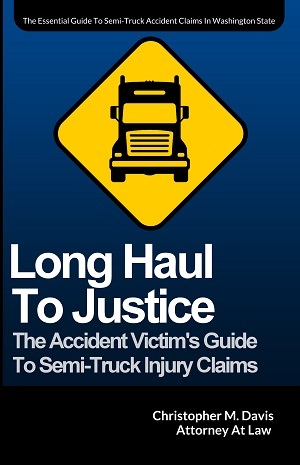 You probably have dozens and dozens of questions after you or someone you know has been seriously injured in a truck accident. Trucking companies will aggressively defend themselves in these cases, and having someone equally experienced on your side is a smart choice. Begin the road to recovery and get what you deserve. If you or someone you know has been involved in an accident with a semi-truck or other commercial trucking vehicle in Washington State, contact Attorney Chris Davis and the team at Davis Law Group at (206) 727-4000, use the chat feature below or fill out the contact form on this page to schedule your free legal consultation.